Reduce anger and improve two-way human-to-human conversations with the help of a mediating/moderating chatbot. This particular bot blocks angry messages which have a bad sentiment score from being delivered to the other chat participant. See conversationaugmentation.com for more information! In a person-to-person conversation, each message is inspected by the mediating chatbot before being passed on. Each message is given a sentiment score using a word-by-word analysis. A negative score indicates that the message is aggressive. Very aggressive messages are blocked by the mediator, and never seen by the other chat participant. The chat user is instead encouraged to write a nicer message, which would then be delivered. This way the most blatant aggressiveness can be avoided, and hopefully slowing down or stopping a downward agressiveness spiral. 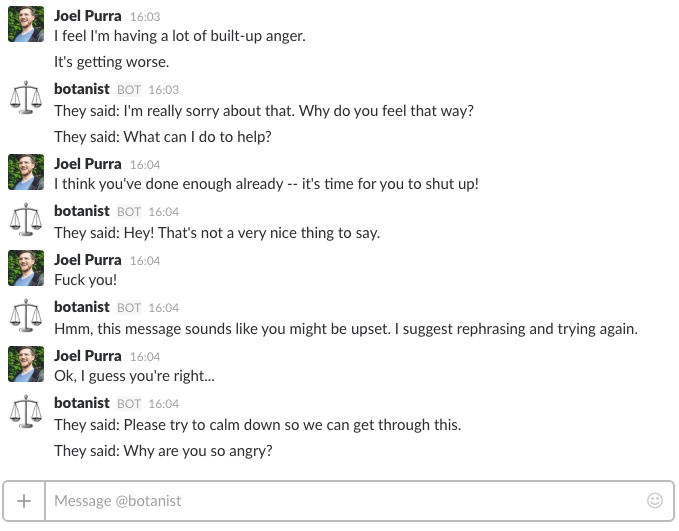 Here is an example conversation between me (Joel Purra) a friend (“they”), in a chat session through a mediator bot called @botanist. The other human’s responses are prefixed with “they said.” One of my messages gets blocked with a notice from @botanist. In order to run the chatbot you need Node.js, a new Slack bot user token, and a MongoDB server. # Run and open the chatbot server and UI/editor. # Chat with your bot through slack! Most messages are let through. Messages with “aggressive” words, such as curse words are blocked. Created at the Bothack.berlin hackathon in at the TLGG offices 2016-11-18–20. Thanks to Karolin Rühlmann, Liron Tocker, all others who helped out, as well as the hackathon organizers. Copyright © 2016 Joel Purra. All rights reserved. When using the conversation-augmentation-chat-mediator-bot source code, comply with the GNU Affero General Public License 3.0 (AGPL-3.0).